The Wednesday plan has been revised due to the toilets at Barbury Castle being out of service and the discovery of a pub that will open especially for us! The morning walk is some 12 miles from the Uffington White Horse to Ogbourne St George for a lunch stop with music and singing at the Inn with the Well. 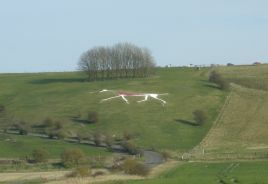 The afternoon walk is then some 9 miles taking in Barbury Castle and the White Horse at Hackpen Hill then on to Avebury. We will meet again at the Uffington Castle car park at 8.45am. We follow the Ridgeway track for 5.5 miles to the road outside Fox Hill where there is a small car park. We then have a mile or so of road walking until we pick up the Ridgeway track again for 5 miles to Ogbourne St George and the Inn with the Well. After lunch, we walk 3 miles to Barbury Castle then another 2 miles to the White Horse on Hackpen Hill. You cannot see the hill figure from the Ridgeway trail. You can walk down the field to see it close up but need to go down the road to get a good view as shown in the picture. There is a car park on the Ridgeway, just above the white horse. Then just another 4 miles to Avebury and a well-earned drink at the Red Lion. The total distance walked today is a little over 20 miles. We will get lifts from Avebury into Marlborough for the evening gig at St Mary’s Church Hall. Parking: Cars may be left at the Uffington White Horse Car Park and at the National Trust Car Park in Avebury.